Near half of British Columbians support plans for a pipeline to transport crude oil from Alberta to the West Coast port of Kitimat for shipping, a new poll by Ipsos suggests. Near half of British Columbians support plans for a pipeline to transport crude oil from Alberta to the West Coast port of Kitimat for shipping, a new poll by Ipsos suggests, but most also say they don't really know much about it. The poll of 1,000 B.C. residents found 48 per cent supported the project, compared with 32 per cent who opposed it. Twenty per cent remained undecided. The poll was paid for by the Enbridge pipeline corporation and had a margin of error of 3.1 per cent. It asked the participants, "Based on what you know to date, would you say that you generally support or oppose the Northern Gateway Pipelines Project?" Support was even higher amongst northern B.C. residents, at 55 per cent. Men were also more likely to support the project, at 58 per cent overall, while only 38 per cent of women polled supported it. But when it came to their familiarity with the project, only 42 per cent of British Columbians said they were familiar with it, while 55 per cent said they were not. Fifty-one said the main benefit of the project would be employment and economic benefits, while 43 per cent cited general environmental concerns as their main concern. The poll results were released just before the start of public hearings into the pipeline kickoff on Jan. 10 in Kitamaat Village. The Joint Review Panel hearings, which were set up by the federal Environment Ministry and the National Energy Board are expected to spend the next two years assessing the project's environmental effects. Enbridge wants to build two 1,170-kilometre-long pipelines from Bruderheim, Alta., to an oil tanker port to be built near Kitimat. One of the pipelines would be used to ship up to 525,000 barrels of oilsands bitumen a day to the coast for export. The other would be used to ship up to 193,000 barrels of light oily material daily to Alberta. The substance is used to thin heavy oil so it can easily pass through pipelines. But a former B.C. 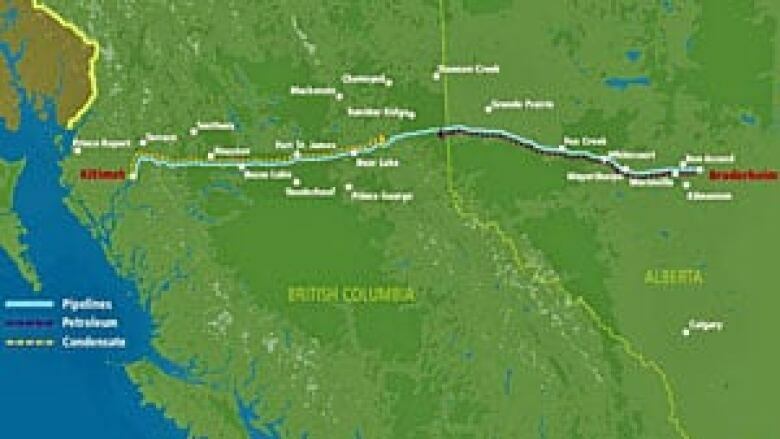 deputy minister of environment says the proposed Northern Gateway pipeline is a threat to northern B.C. 's pristine coastline. Thomas Gunton, who now serves as the director of Simon Fraser University's resource and environmental planning program says oils spills are an inevitable part of oil pipelines. "If you look at Enbridge's pipeline systems operations over the last number of years they have had an average of about 70 oils spills a year on their pipelines." "Last year they had 80 spills, some of these very large. So oil spills are just part of the business of pipelines," said Gunton. Gunton says instead of building a pipeline to the West Coast, the oil should be moved directly south to the U.S. by a different pipeline to limit the number of tankers in B.C. waters. "The principal concern is related to tanker spills around Haida Gwaii, and I'm sure everyone remembers the Exxon Valdez spill back in 1989 which caused devastating, catastrophic environmental effects in Prince William Sound," he said. "Those effect still persist two decades later. The area has not recovered." A recent report commissioned by Alberta says oilsands producers could lose up to $72 billion if a pipeline isn't built to ship heavy crude to the British Columbia coast. YOUR VOTE: Should the pipeline go ahead?